The Shed’s latest alternative offering is writer/director Nadia Fall's Home – a show that asks the audience what home means to them and, in response, casts a light on what home is to a group of troubled teens residing in an east London shelter. It’s a tough topic, yet the bouncy show-tunes resembling songs that might have been in Broadway’s Rent or the TV series Glee, provide a feeling that everything is going to be okay. Maybe a little too okay. In a documentary-style framework, the residents at Target East reveal their heart-rending backgrounds. One young boy confides to the audience via a Beyonce song that he wants to perform, but his mother never believed in him, telling him she wished he'd never been born. Another girl reveals how she was smuggled to London in a lorry. A second woman tells us she was made pregnant by a man she could not name. Their stories are harrowing, and as Nadia Fall and researching partner Esta Orchard found, very real. Both women interviewed children at homeless centres in East London, helping to provide testimonials of what life is like for young people without proper families or homes. While the roles are performed by talented, well-trained actors, the personal anecdotes are told with an authenticity that easily allows one to believe their plights. Sharon, played by Ashley McGuire, furthers this experience by convincingly portraying the managing matriarch who looks after each entrant with both rigidity and heart. Trevor Michael Georges also lends a hand with credibility by playing the steely key worker who is made to enforce ultimatums should rules be broken — and as one might imagine, hardly are the rules adhered to. The shelter’s microcosm of both frustrated residents and workers is aptly created, thanks also in part to the crafty set that allows the audience to peer through a window into the reception where drugs, thugs and lovers attempt to smuggle their way in. 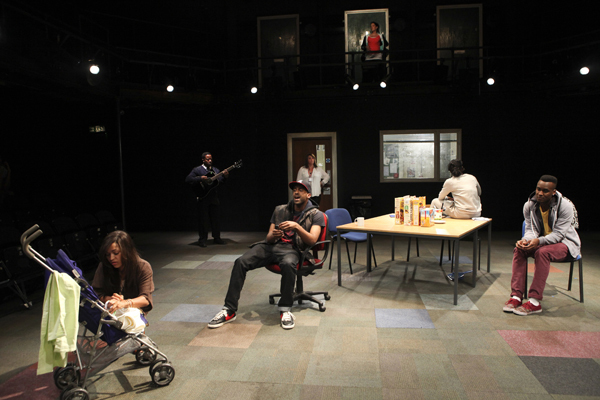 The main stage imaginatively houses the communal kitchen, manager’s office and outdoor garden where a sense of family among the group is visible, whether through tears or laughter. A second floor acts as both the residents' hall and a platform for the performers to sing from (once again conjuring up images of Rent). The subject is very 'now', with a reported 1.5 million children maltreated in Britain each year. As one character reminds all when discussing an ex-resident’s death, “This is the culture in London: that’s just the way it is." While she might be right, we hope there are more shelters like the one Nadia Fall informatively brings to life — minus a few of the song and dance segments that are over-egged and out of place. Be on the look-out for the talented beatboxer Grace Savage who provides all the sound effects and music (apart from a few guitar chords). It's magic. Home is at The Shed through 7 September. Evening shows Tuesday–Sundays 8pm with matinees Saturday and Sundays at 3pm. Running time is 2 hours, 20 minutes with one interval. Tickets are £20.00 with restricted view day tickets at £12.